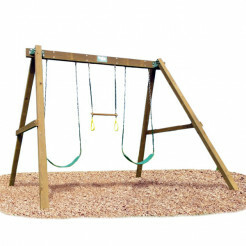 This basic swing set from Creative Playthings has enough room for two sling swings and trapeze rings. Choose between roped or chained accessories. 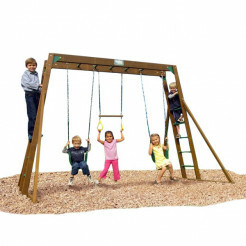 The Classic Swing Set II is one of Creative Playthings' basic swing sets which includes 2 swings and a trapeze bar hanging from a set of monkey bars.